If you regularly have difficulty finding important papers, it may be time to declutter your files. Maybe you don’t even have a filing system to declutter, just a lot of accumulated paper that’s hard to keep track of. 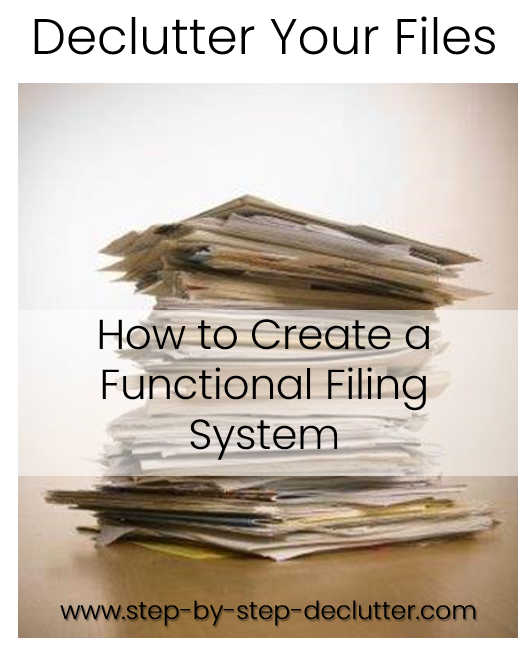 Whether you are cleaning out your files or establishing a filing system, the information that follows will help you to create a system that works for you. Purging is the foundation of the decluttering process. No matter what you are organizing, success lies with effective purging. This fact is as true for paper as anything else. In order to declutter your files, you’ve got to purge them of unnecessary papers. That means touching every single piece of paper, examining it and determining if it should be kept, shredded or recycled. If you don’t have files, then the place to start is with purging your loose papers. If you are creating files for reference material, you’ll need to be especially critical in determining what to keep. Only save that which you are certain you will refer back to. If you’re not sure, consider scanning documents onto your computer and saving them electronically to conserve space in your file drawers. 1/3 cut file folders are folders with staggered tabs divided into three sections: right justified, center justified, and left justified. By staggering the location of the tabs, you can more easily identify the file you're looking for at a glance without having to thumb through large sections of the file cabinet. It can be difficult to know what papers are safe to discard and what papers need to be retained for safe-keeping. H & R Block offers a helpful infographic on this topic. Click on the image below to view a larger version. Hanging files are used to group related subcategory file folders alphabetically within the appropriate category. Read on for clarification. The products pictured above are some my favorite supplies for setting up a filing system. To purchase a product (or to shop for similar products) click on the images. These are affiliate links. Click here to find out more about what that means. The best method to declutter your files is the one that makes the most sense to you. The key is to file things in such a way that finding them is quick and easy. Within each general category there will be subcategories. The subcategories are where you get specific. They are what makes finding things simple once you have achieved your goal to declutter your files. Create a separate file for any specialty care received by members of your family (cardiologist, oncologist, etc.). This is especially important if you move frequently. *These files are best kept in a fireproof safe or safety deposit box. A naming convention is simply a standardized method for naming something, in this case files. The use of naming conventions within your filing system is crucial to the long term success of your filing system. It's what ensures that you are able to file and find things quickly. By using the same system for labeling all your files, you make it easier (both for yourself and for others) to find what you are looking for. Such a file folder would be placed in alphabetical order within the Financial category. By starting each file label off with the name of the subcategory (banking) you ensure that all related files are grouped together. If you have accounts in more than one bank, for instance, this can be very handy. Instead of searching for HSBC, Bank of America, Chase, etc. under different letters of the alphabet, all your banking files are in one location. Within a subcategory, organize alphabetically. In the case of the banking example, Bank of America files would precede HSBC files and so forth. If you have multiple accounts with the same bank, organize them alphabetically as well (checking before savings, and so forth). Declutter your files through the use of consistent naming conventions. Even though your goal is to declutter your files, it will be necessary to hang on to some files simply for reference purposes. For instance, income tax information should be saved for several years but not indefinitely. Income tax information for the current year (or previous year if you haven't yet filed your taxes) should be kept with current files. On the other hand, income tax information from previous years can be archived so that it doesn’t clog up your current files. 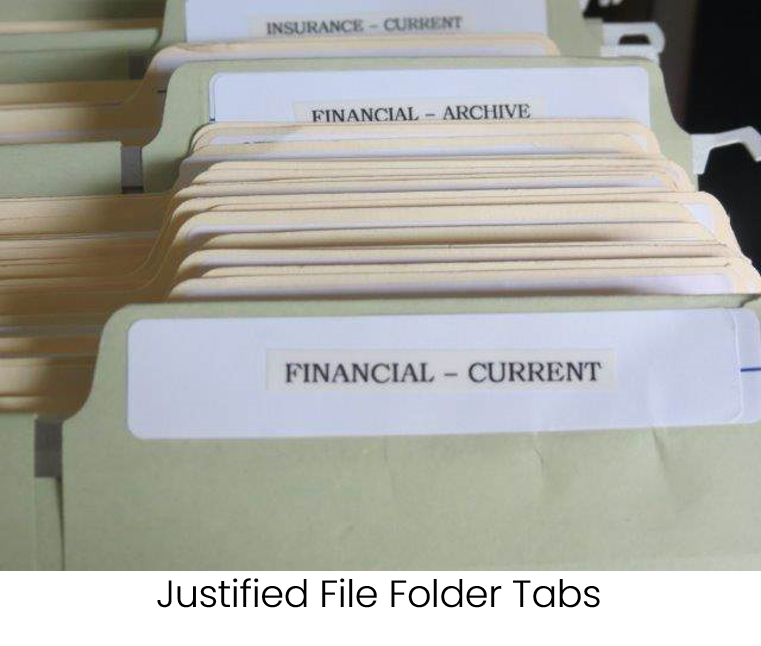 Separate current (active) files from archived (inactive) files to make your filing system more efficient. As an organizer, I have been advised by multiple sources (usually other organizers) to justify file folder tabs, or line them up so that all the tabs are on the same side of the file folders. It’s supposedly easier on your eyes if they don’t have to scan back and forth. Files can be removed or added without destroying the organization within the file drawer. It’s for the latter reason that I decided to try it with my own files. This method was not well received at my house. My husband despised it, and I eventually ended up redoing the whole thing so that the tabs were once again staggered. To be honest, I wasn't a big fan of the justified tab method myself. Rather than finding it easier to read the tabs on the justified file folders, we found it frustrating. With the tabs staggered, we could generally locate a folder at a glance. 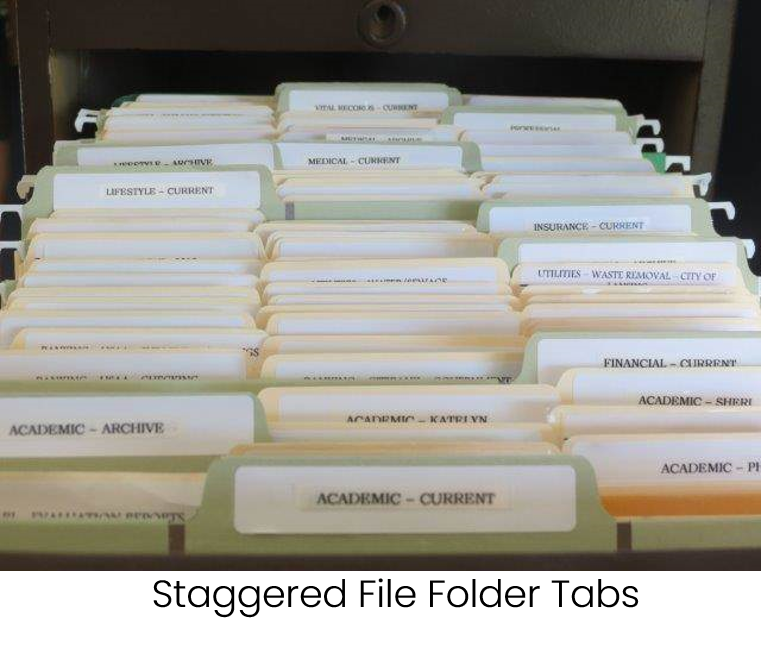 Because the folders are organized alphabetically within each category, we knew approximately where that would place a particular file within the drawer, and we could go right to it with ease. With the tabs justified, we had to thumb through the whole lot of them in order to separate the individual files so we could see their labels. In the end, it doesn't matter which method you choose for arranging your file folders. I just thought it would be useful to point out the pros and cons of both methods so that you could make an informed decision and also understand why I recommend 1/3 cut file folders. If you found this page helpful, please consider sharing it with friends. Also, leave me a comment in the section below. I would love to hear from you.